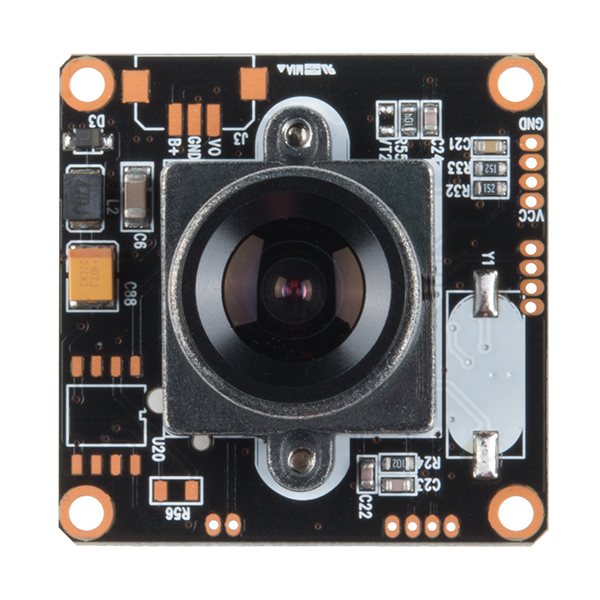 This is a high-quality color CMOS camera module. Power the CM-32 module, hook up any display, monitor, or LCD screen with an RCA input and get vivid color video at 728x488 resolution. 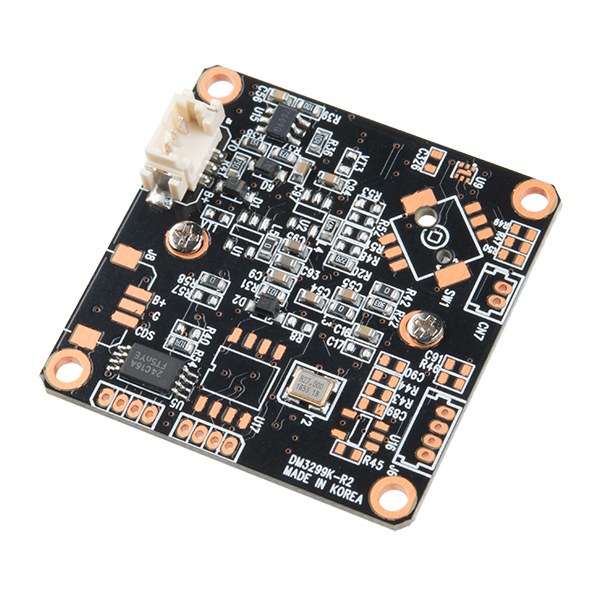 Module is easily mountable and has a wide operating voltage (6V to 20V). Comes with high quality optics, all the on board circuitry to output RCA signal, and cable harness. can I use this with a raspberry pi? I'm trying to mount this on my rocket and have a lightweight controller for everything, have any ideas for something like this? Ah, but we got Rob to stop picking his nose! Would it be possible to hook this up to an arduino wirelessly send it to another arduino then hook it up to a screen and have a live feed? If so How? Is this recommended for use in October 2015 with a photon from particle? I want to get started with a simple live feed from a camera. Anyone knows what the viewing angle is? I'm guessing about 60 degrees, but it doesn't seem to be specified in the datasheet. Where would I put the video output cord in an arduino? What is the FPS rate? What is the data storage rate? Is there audio, or a suggested add on for audio? Never before seen such a useless "datasheet". Anyone know anything about the lens? I am interested in the focal length. I have spiced the yellow signal wire to a RCA jack and pluged it into the video in on a TV. Powered the camera with a 9v battery. I get no signal. Is there more to it than that? I had to put the shielding on yellow cable to ground as well for it to work. Does anyone know what type of cable is used on this unit, in case I need a replacement? Trying to build an underwater ROV and thinking this would be a good camera for it (obviously we would have to pot it). Anyone know if there would be any problems with this? What sort of item would I need to have 6 cameras running and recording at once? I'm guessing something that takes 6 inputs, correct? I would like to be able to view all 6 inputs at the same time on the same screen and be able to record it to a hard drive. hi. 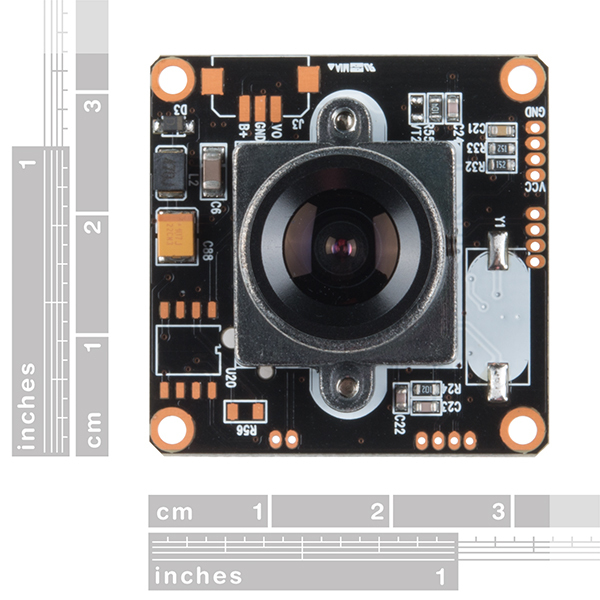 i want to use this camera on a ultra micro-quad copter and would like to video stream this to a computer via wifi. how could i go about doing this? This camera has NTSC output. You would need to find the rest of the equipment that can input that signal and transmit it to a receiver. If you google "FPV" (First Person View), you'll find many options. Good luck! Im using this camera in an arduino project i am doing, i need to connect this camera to the arduino mega 2560, does anybody know if there is a video input on that arduino that would suit this camera? if not what hardware would i need to be able to do this? Does it work with 5V (as SEN-08739) ? I got mine to work with a tv. Is there a way I can get it to store video? Not by itself. You'll need to run it to a VCR or other video recorder to save what it's seeing. To store video, you'll need something like the Flycam or HackHD. Hope this helps! If i try and use this on a display that's 640x480 is it gonna be stretched/croped/scaled? OR will that be up to the display driver? Tell me if this is a stupid idea. Looks like the horizontal scanning is at 15KHz. So if we assume 728 pixels, then I think the video signal would be something like 10MHz. Could I sample signal at 20MHz and reliably reproduce this signal later through a D/A? I realize this will use a lot of space as there would be no compression. But I only want to record say 10 minutes at a time. Is this the right frequency? What resolution do I need to capture and regenerate a video signal? I dont htink an arduino can do this speed, but an ARM based one perhaps could. Or just a chip alone without arduino overhead. Anyone can suggest me how to use this to send image to my single color LED matrix? thanks! Are these supposed to get warm when powered. Im powering from a LIPO 3S 11.4 but it doesnt get warm or give a signal. Any ideas ? I have not noticed it getting warm at all. I have this connected to a 5.8GHz wireless transmitter, which does get warm, but not this camera. 60 fields per second, 30 frames per second. I'm trying to just pick up live video and reroute it to a simple small screen. Would this and an arduino or raspberry pi work? You don't need an Arduino or Pi; you can connect this camera directly to a screen that accepts composite video, such as this one. Is this camera compatible with M12 lenses? Is this the NTSC or PAL model? the description mentions the "CM-32" but the datasheet refers to a "32-KM NTSC" or "32-KM PAL" ? Any chance you will be bringing out a PAL version? Can this be hooked up to the new pcDuino? I'd like to be able to do some basic face detection without an extra computer. Note that this is an analog, not a digital camera. It's great for hooking up to TV sets, video recorders, analog transmitters etc. but it would take a lot of hardware (called a framegrabber) to hook it up to a microcontroller and get results useful for face tracking. Fortunately, since the PCDuino runs Linux, it has the ability to easily connect to inexpensive webcams, so you might look into those. Thanks for the reply, I'll try that idea. 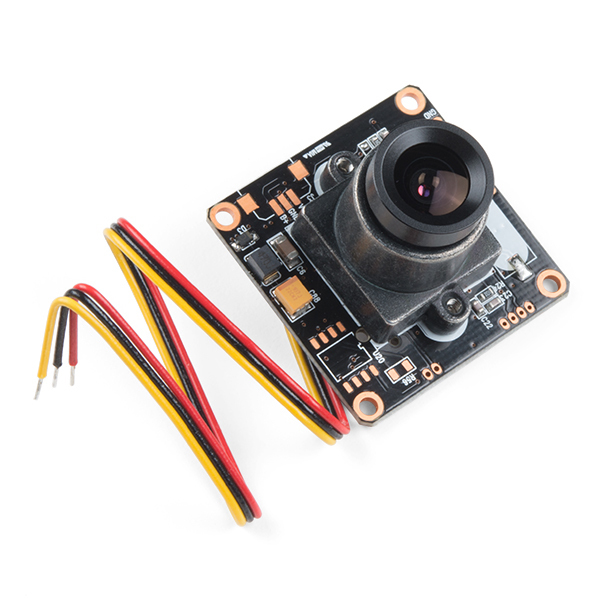 Can this camera also pick up IR? In my experience, the imager itself will be able to pick up IR, but typically an IR cutoff filter is included on the back of the lens. Often this is just a sticker that can be removed, but I could not say for sure on this module. Will there be some tutorials on interfacing with this camera? My objective is capturing the live video with OpenCV to process the images. As I understand, the camera output is analog and I am wondering what I need to convert the analog feed to digital frames to be processed. Eventually I would like to mount this on a small robot. In brief, I am ready to purchase, but need to know what other components I need to purchase to power it correctly, capture the video feed as individual images for further processing. To interface with an Arduino you'd need this shield https://www.sparkfun.com/products/10032 Total project costs gets a bit high though and you'd consume virtually all arduino resources just processing the signal. Personally I'd go with a digital camera instead capable of sending TTL data. One of these 2: https://www.sparkfun.com/products/10061 https://www.sparkfun.com/products/11610 or rip apart a cheap web camera. For low res robot vision I've even seen people take optical sensors out of laser mice and integrate them into designs. Resolution is typically low (no higher than 16x16), but as a benefit, the signal is easy to process and the refresh rate is high enough to allow shape tracking and rapid obstacle detection at close range. How exactly would you go about by ripping apart a web camera, I would love to try. The webcam might need a USB host to operate it and that means 'CHALLENGE' ! Step 1. Acquire web camera. Step 2. Rip it apart. Nice camera I'm sure others will like it as well. Video looks great I'm using it with an automotive backup LCD color screen I bought through Amazon. First I will use it inside my heating ducts looking for rodent problems. Then for the original purpose of an underwater ROV that me and my grandson are working to see fish and crabs. He love that stuff. This is easy to use and has decent resolution. The lens/focal length is adjustable if you can find a tiny enough hex key to undo the set screw. I've been using mine to get really close up macro type images of bugs. It would also work well as a vehicle backup camera or security camera. the composite video makes it easy to hook up to a compatible screen, but a little more challenging to use if you want to save digital video.